How do I insert a stop/restart file to my running job? 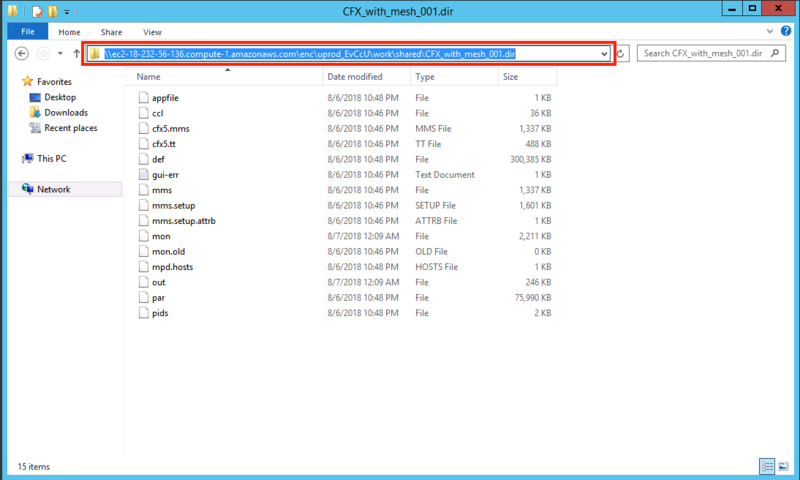 This tutorial shows you how to stop a running CFX Solver from the command line. Similar to pressing the stop button in the ANSYS CFX GUI, inserting a stop file executes the stop and writes a restart file at the end of an outer loop iteration in steady state simulations, or at the end of a timestep in transient analyses. To complete this task, you will need to use our in-browser SSH. Go to the Status page of your job. Then below the Live Tailing panel, you will see an SSH panel with a thunderbolt symbol. In the SSH panel, you will see a Server IP address which you can click to launch an in-browser SSH terminal. This way, you can interact with the running cluster from your browser. For more information on using Rescale&apos;s in-broswer SSH feature, please refer to the tutorial here. Inserting a stop file will generate a .res restart file that can be used to restart the simulation. In the Results page of the stopped job, you may make the restart file available as an input file (see image below), then clone the job. In the new cloned job, insert the restart file in place of the input file both in the Input Files page, as well as, in the Command in the Software Settings page of the Setup. 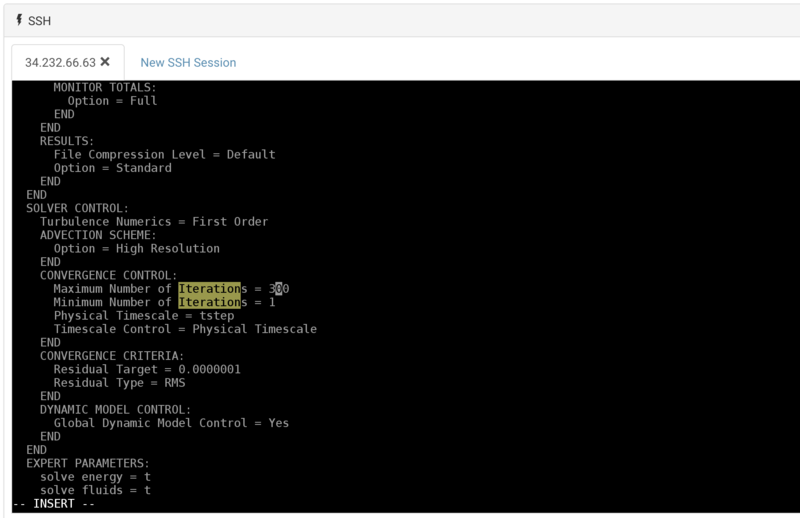 How do I edit solver parameters/settings during a CFX batch run? During the run, you can connect to the cluster using Rescale&apos;s in-browser SSH option or through your local workstation. Please refer to this section for more information about connecting to your cluster. 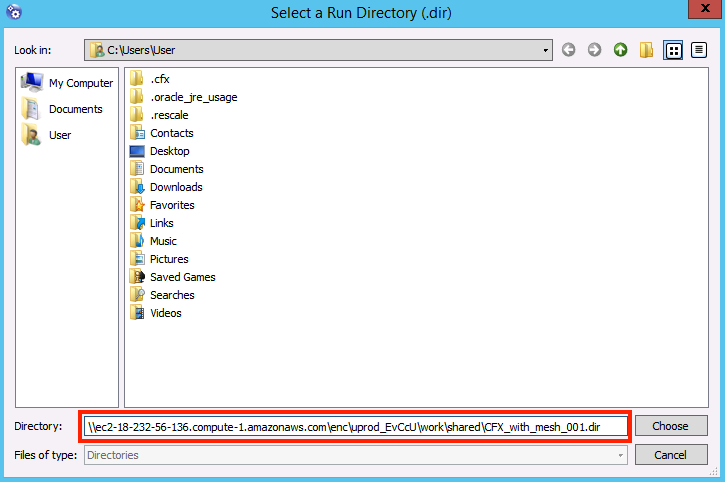 Navigate into the temporary <file-name>.dir directory which is present in ~/work/shared directory. The directory will have a ccl file. Open the file using a suitable text editor (like vi or vim). The ccl file is a list of solver settings depending in your model. You can make suitable changes to the settings here (NOTE: Since ccl is a sensitive file, please take care while editing it). Please refer to the ANSYS CFX documentation for more information about CCL and parameters which can be edited. You can use / for searching strings in a long file while using vi or vim. For example, if you are editing the maximum number of iterations, you can search for the string in vi or vim editor by typing /iterations. This will highlight all the instances of this word. You can press n to move to the next instance. Once you are finished editing the ccl file, save the file. Copy this new ccl file outside the <file-name>.dir. To update the solver with the new ccl file, use the command given below. CFX will display all the changes made in the ccl file. If you do not wish to create a back up file before updating the solver with new settings, include a -no-backup flag at the end of the command. 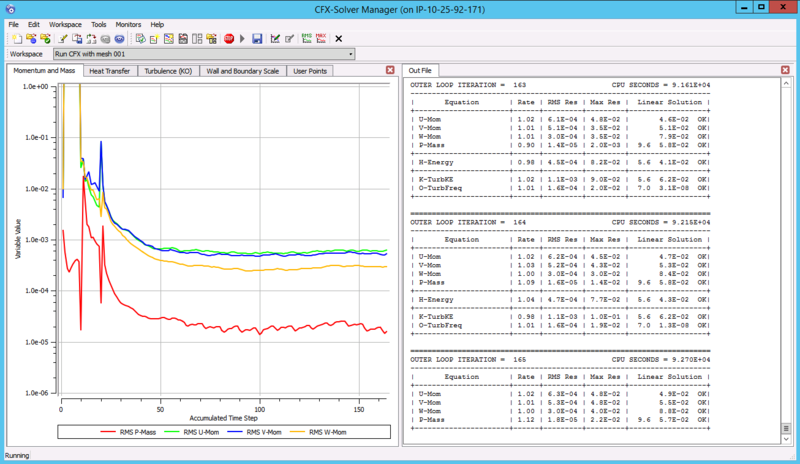 ANSYS CFX jobs can be monitored using the CFX Solver Manager which plots the residuals and the .out file data. 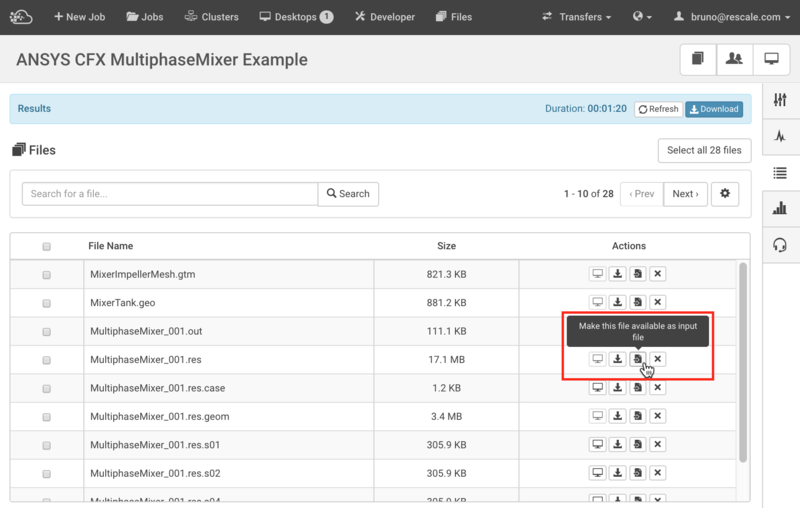 To monitor a CFX batch job running on the ScaleX platform, users can attach a running job to a Rescale Desktop and monitor the progress by pointing the CFX Solver Manager to the temporary .dir directory that the CFX Solver creates during a run. Click on the Desktops icon on the top and click on the + New Custom Desktop icon. Choose a suitable Windows Desktop Configuration. Under ADD SOFTWARE, search for ANSYS Fluids Desktop. Select the appropriate version and fill in the required license information. 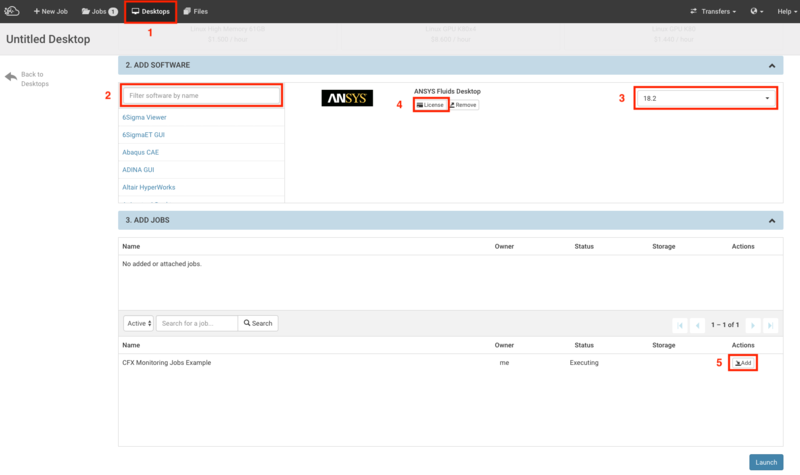 Under ADD JOBS, search for your running job and select the job by clicking on Add icon beside the job. Finally, click on the Launch button. The Rescale desktop will be launched in a few minutes. The desktop can be viewed using either In-Browser option or using Remote Desktop Connection. Please refer to this section for more details on Rescale Desktops. On the desktop, click on the CFX icon to open the CFX Launcher. 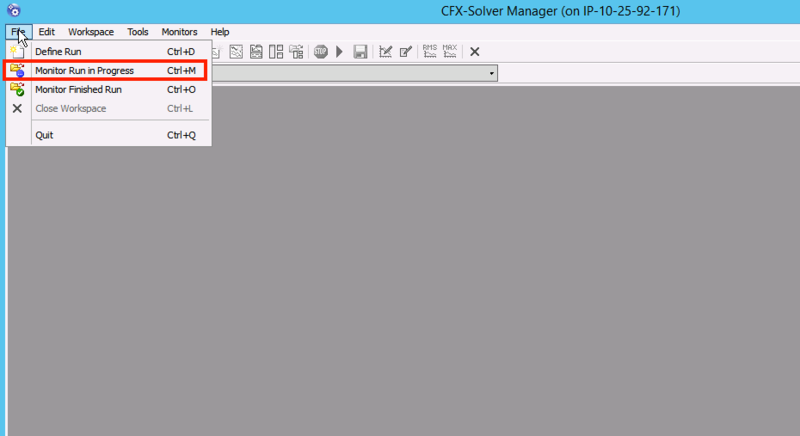 On the CFX Launcher, click on CFX-Solver Manager icon. Open File > Monitor Run in Progress. Paste the path that you had copied earlier in the Directory field and click on Choose. A warning message (Cannot create Monitor Lock File) will appear. Users can ignore this by clicking OK.